Are you looking to purchase from a huge range of accessories for your hot tub or spa? 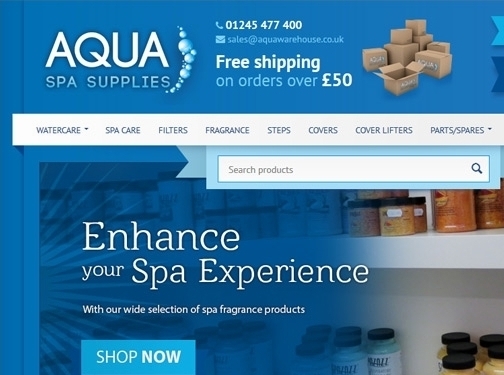 If so, why not take a look at Essex's Aqua Spa Supplies has to offer. From hot tub fragrances, covers and cover lifters through to steps, filters and spare parts, this company are confident that they have in stock anything you could ever want, for just about any model! With FREE DELIVERY on orders over £50 and a fantastic range of products, they've got us convinced that this is THE online store for hot tub and spa accessories and we encourage you to visit their site to take a look at what they have on offer. Having already established themselves as leaders in the hot tub market through their parent company, Aqua Warehouse, Aqua Spa Supplies has been launched to offer an online solution to purchase parts, accessories and so much more. If you own a hot tub or spa do yourself a favour and visit the site, see what they have to offer and place an order! UK (Southend, Essex) based business - established in 2003 - providing spa / hot tub accessories/supplies. Website includes e-commerce facilities, delivery and returns information, terms and conditions, FAQs, details of business premises, associations, full contact details.